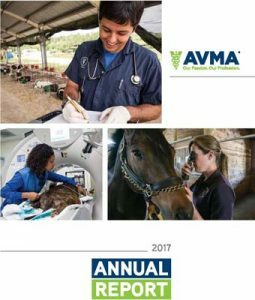 The American Veterinary Medical Association’s 2017 Annual Report, released Aug. 1, offers a glimpse into progress the association has made in its ongoing effort to support its members and enhance the practice of veterinary medicine. Journal of the American Veterinary Medical Association subscribers receive a copy of the report; members who don’t receive JAVMA can read it online. AVMA LIFE and AVMA Professional Liability Insurance Trust merged with the goal to provide enhanced services and expanded products for members. The Veterinary Career Center (VCC) was used by 23,907 veterinary job seekers and 3,438 employers, with 17,377 jobs posted during the year. It continues to be the premier job board for veterinary medicine. More than 1,000 veterinary professionals earned CE credit while learning about different careers during live webinars offered by the VCC. The American Animal Hospital Association/Veterinary Management Group Chart of Accounts was revised, expanded, and made available to all veterinary professionals. It provides an accessible way for smaller practices to better organize finances. The association hired its first-ever director of member well-being and diversity initiatives, whose work has focused on enhancing the well-being of members and advancing our commitment to ensuring diversity and inclusion in all aspects of the veterinary profession. The new, award-winning Wheel of Well-being features activities designed for veterinary team members to boost mental and physical health. The American Veterinary Medical Foundation provided nearly $180,000 (as of March 2018) in relief and reimbursement grants to AVMA members and others who lost essential items or delivered emergency support during extreme natural disasters. More than 5,000 professionals wrote and called members of U.S. Congress to support the Public Service Loan Forgiveness program. Worked with Congress to secure $2.35 million in funding for the Veterinary Services Grant Program. The AVMA Political Action Committee raised more than $148,000, opening doors for the government relations team to engage with lawmakers and advocate on important issues that impact how veterinarians practice medicine. Copyright ©2019 Veterinary Practice News unless otherwise noted.